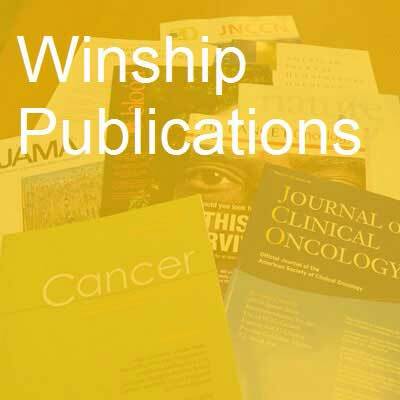 Various first authors and senior authors from Winship Cancer Institute have published 91 studies in major medical and scientific journals in the past month. Imagining roles for epigenetics in health promotion research. McBride CM, Koehly LM. Journal of behavioral medicine. 2017; 40(2):229-238. PubMed PMID: 27412775; PubMed Central PMCID: PMC5332486. Development and validation of a high-fidelity phonomicrosurgical trainer. Klein AM, Gross J. The Laryngoscope. 2017; 127(4):888-893. PubMed PMID: 27620827. Evaluation of a Novel Difficulty of Smoking Cessation Phenotype Based on Number of Quit Attempts. Stevens VL, Jacobs EJ, Gapstur SM, Carter BD, Gaudet MM, Westmaas JL, Patel AV. Nicotine & tobacco research : official journal of the Society for Research on Nicotine and Tobacco. 2017; 19(4):435-441. PubMed PMID: 27629278. Diagnostic Accuracy and Visual Search Efficiency: Single 8 MP vs. Dual 5 MP Displays. Krupinski EA. Journal of digital imaging. 2017; 30(2):144-147. PubMed PMID: 27798745; PubMed Central PMCID: PMC5359202. Randomized, Placebo-Controlled, Phase II Study of Veliparib in Combination with Carboplatin and Paclitaxel for Advanced/Metastatic Non-Small Cell Lung Cancer. Ramalingam SS, Blais N, Mazieres J, Reck M, Jones CM, Juhasz E, Urban L, Orlov S, Barlesi F, Kio E, Keiholz U, Qin Q, Qian J, Nickner C, Dziubinski J, Xiong H, Ansell P, McKee M, Giranda V, Gorbunova V. Clinical cancer research : an official journal of the American Association for Cancer Research. 2017; 23(8):1937-1944. PubMed PMID: 27803064. Bone marrow microenvironment-derived signals induce Mcl-1 dependence in multiple myeloma. Gupta VA, Matulis SM, Conage-Pough JE, Nooka AK, Kaufman JL, Lonial S, Boise LH. Blood. 2017; 129(14):1969-1979. PubMed PMID: 28151428. Whole Slide Imaging for Analytical Anatomic Pathology and Telepathology: Practical Applications Today, Promises, and Perils. Farris AB, Cohen C, Rogers TE, Smith GH. Archives of pathology & laboratory medicine. 2017; 141(4):542-550. PubMed PMID: 28157404. Biomarker, Molecular, and Technologic Advances in Urologic Pathology, Oncology, and Imaging. Ellis CL, Harik LR, Cohen C, Osunkoya AO. Archives of pathology & laboratory medicine. 2017; 141(4):499-516. PubMed PMID: 28157406. Decreasing Hospital Readmission in Ileostomy Patients: Results of Novel Pilot Program. Shaffer VO, Owi T, Kumarusamy MA, Sullivan PS, Srinivasan JK, Maithel SK, Staley CA, Sweeney JF, Esper G. Journal of the American College of Surgeons. 2017; 224(4):425-430. PubMed PMID: 28232058. Body Size Indicators and Risk of Gallbladder Cancer: Pooled Analysis of Individual-Level Data from 19 Prospective Cohort Studies. Campbell PT, Newton CC, Kitahara CM, Patel AV, Hartge P, Koshiol J, McGlynn KA, Adami HO, Berrington de González A, Beane Freeman LE, Bernstein L, Buring JE, Freedman ND, Gao YT, Giles GG, Gunter MJ, Jenab M, Liao LM, Milne RL, Robien K, Sandler DP, Schairer C, Sesso HD, Shu XO, Weiderpass E, Wolk A, Xiang YB, Zeleniuch-Jacquotte A, Zheng W, Gapstur SM. Cancer epidemiology, biomarkers & prevention : a publication of the American Association for Cancer Research, cosponsored by the American Society of Preventive Oncology. 2017; 26(4):597-606. PubMed PMID: 28314823; PubMed Central PMCID: PMC5380577. Radiation Oncology in the Developing Economies of Central and Eastern Europe. Esiashvili N. Seminars in radiation oncology. 2017; 27(2):150-157. PubMed PMID: 28325241. Forgoing Conventional Therapy in Phase I Oncology Research: Don't Forget About the Children. Wetmore C. The American journal of bioethics : AJOB. 2017; 17(4):72-73. PubMed PMID: 28328378. The Church, the State, and Vaccine Policy. Bednarczyk RA, Tate T, Opel DJ, Omer SB. The American journal of bioethics : AJOB. 2017; 17(4):50-52. PubMed PMID: 28328365. Label-Free Imaging of Female Genital Tract Melanocytic Lesions With Pump-Probe Microscopy: A Promising Diagnostic Tool. Robles FE, Deb S, Fischer MC, Warren WS, Selim MA. Journal of lower genital tract disease. 2017; 21(2):137-144. PubMed PMID: 28157824; PubMed Central PMCID: PMC5365357. New Developments in Breast Cancer and Their Impact on Daily Practice in Pathology. Li X, Oprea-Ilies GM, Krishnamurti U. Archives of pathology & laboratory medicine. 2017; 141(4):490-498. PubMed PMID: 28353377. Cytologic features and clinical implications of undifferentiated carcinoma with osteoclastic giant cells of the pancreas: An analysis of 15 cases. Reid MD, Muraki T, HooKim K, Memis B, Graham RP, Allende D, Shi J, Schaeffer DF, Singh R, Basturk O, Adsay V. Cancer. 2017; PubMed PMID: 28371566. Exposure to bacterial products lipopolysaccharide and flagellin and hepatocellular carcinoma: a nested case-control study. Fedirko V, Tran HQ, Gewirtz AT, Stepien M, Trichopoulou A, Aleksandrova K, Olsen A, Tjønneland A, Overvad K, Carbonnel F, Boutron-Ruault MC, Severi G, Kühn T, Kaaks R, Boeing H, Bamia C, Lagiou P, Grioni S, Panico S, Palli D, Tumino R, Naccarati A, Peeters PH, Bueno-de-Mesquita HB, Weiderpass E, Castaño JM, Barricarte A, Sánchez MJ, Dorronsoro M, Quirós JR, Agudo A, Sjöberg K, Ohlsson B, Hemmingsson O, Werner M, Bradbury KE, Khaw KT, Wareham N, Tsilidis KK, Aune D, Scalbert A, Romieu I, Riboli E, Jenab M. BMC medicine. 2017; 15(1):72. PubMed PMID: 28372583; PubMed Central PMCID: PMC5379669. Stat5 deficiency decreases transcriptional heterogeneity and supports emergence of hematopoietic sub-populations. Wang Z, Bunting KD. Oncotarget. 2017; 8(14):22477-22482. PubMed PMID: 28390194. Renal allograft granulomatous interstitial nephritis: observations of an uncommon injury pattern in 22 transplant recipients. Farris AB, Ellis CL, Rogers TE, James Chon W, Chang A, Meehan SM. Clinical kidney journal. 2017; 10(2):240-248. PubMed PMID: 28396741; PubMed Central PMCID: PMC5381240. Immune responses and long-term disease recurrence status after telomerase-based dendritic cell immunotherapy in patients with acute myeloid leukemia. Khoury HJ, Collins Jr RH, Blum W, Stiff PS, Elias L, Lebkowski JS, Reddy A, Nishimoto KP, Sen D, Wirth 3rd ED, Case CC, DiPersio JF. Cancer. 2017; PubMed PMID: 28411378. Ancillary testing strategies in salivary gland aspiration cytology: A practical pattern-based approach. Griffith CC, Siddiqui MT, Schmitt AC. Diagnostic cytopathology. 2017; PubMed PMID: 28411379. Second-Line Hormonal Therapy for Men With Chemotherapy-Naïve, Castration-Resistant Prostate Cancer: American Society of Clinical Oncology Provisional Clinical Opinion. Virgo KS, Basch E, Loblaw DA, Oliver T, Rumble RB, Carducci MA, Nordquist L, Taplin ME, Winquist E, Singer EA. Journal of clinical oncology : official journal of the American Society of Clinical Oncology. 2017; :JCO2017728030. PubMed PMID: 28441112. Second-Line Hormonal Therapy for Men With Chemotherapy-Naïve Castration-Resistant Prostate Cancer: American Society of Clinical Oncology Provisional Clinical Opinion Summary. Virgo KS, Rumble RB, Singer EA. Journal of oncology practice. 2017; :JOP2017022970. PubMed PMID: 28445101. Is C-reactive protein ready for prime time in the selection of antidepressant medications? Miller AH, Trivedi MH, Jha MK. Psychoneuroendocrinology. 2017; PubMed PMID: 28449941. Corrigendum to "Plasma metabolomics in adults with cystic fibrosis during a pulmonary exacerbation: A pilot randomized study of high-dose vitamin D3 administration" [Metabolism vol. 70, May 2017, pages 31-41]. Alvarez JA, Chong EY, Walker DI, Chandler JD, Michalski ES, Grossmann RE, Uppal K, Li S, Frediani JK, Tirouvanziam R, Tran VT, Tangpricha V, Jones DP, Ziegler TR. Metabolism: clinical and experimental. 2017; PubMed PMID: 28456337. Bayesian modeling and prediction of accrual in multi-regional clinical trials. Deng Y, Zhang X, Long Q. Statistical methods in medical research. 2017; 26(2):752-765. PubMed PMID: 25367100; PubMed Central PMCID: PMC4417665. Distal Cholangiocarcinoma and Pancreas Adenocarcinoma: Are They Really the Same Disease? A 13-Institution Study from the US Extrahepatic Biliary Malignancy Consortium and the Central Pancreas Consortium. Ethun CG, Lopez-Aguiar AG, Pawlik TM, Poultsides G, Idrees K, Fields RC, Weber SM, Cho C, Martin RC, Scoggins CR, Shen P, Schmidt C, Hatzaras I, Bentrem D, Ahmad S, Abbott D, Kim HJ, Merchant N, Staley CA, Kooby DA, Maithel SK. Journal of the American College of Surgeons. 2017; 224(4):406-413. PubMed PMID: 28017812. AKT1, LKB1, and YAP1 Revealed as MYC Interactors with NanoLuc-Based Protein-Fragment Complementation Assay. Mo X, Qi Q, Ivanov AA, Niu Q, Luo Y, Havel J, Goetze R, Bell S, Moreno CS, Cooper LA, Johns MA, Khuri FR, Du Y, Fu H. Molecular pharmacology. 2017; 91(4):339-347. PubMed PMID: 28087810; PubMed Central PMCID: PMC5363710. Association of Lymphovascular Space Invasion With Locoregional Failure and Survival in Patients With Node-Negative Oral Tongue Cancers. Cassidy RJ, Switchenko JM, Jegadeesh N, Sayan M, Ferris MJ, Eaton BR, Higgins KA, Wadsworth JT, Magliocca KR, Saba NF, Beitler JJ. JAMA otolaryngology-- head & neck surgery. 2017; 143(4):382-388. PubMed PMID: 28097311; PubMed Central PMCID: PMC5398912. Delayed treatment of 6-Bromoindirubin-3'-oxime stimulates neurogenesis and functional recovery after focal ischemic stroke in mice. Wang LL, Li J, Gu X, Wei L, Yu SP. International journal of developmental neuroscience : the official journal of the International Society for Developmental Neuroscience. 2017; 57:77-84. PubMed PMID: 28111255; PubMed Central PMCID: PMC5344848. Identifying and targeting cancer stem cells in the treatment of gastric cancer. Bekaii-Saab T, El-Rayes B. Cancer. 2017; 123(8):1303-1312. PubMed PMID: 28117883. In Vitro and In Vivo Synergistic Antitumor Activity of the Combination of BKM120 and Erlotinib in Head and Neck Cancer: Mechanism of Apoptosis and Resistance. Anisuzzaman AS, Haque A, Wang D, Rahman MA, Zhang C, Chen Z, Chen ZG, Shin DM, Amin AR. Molecular cancer therapeutics. 2017; 16(4):729-738. PubMed PMID: 28119490. Associations of Calcium and Milk Product Intakes with Incident, Sporadic Colorectal Adenomas. Um CY, Fedirko V, Flanders WD, Judd SE, Bostick RM. Nutrition and cancer. 2017; 69(3):416-427. PubMed PMID: 28128980. Paleolithic and Mediterranean Diet Pattern Scores Are Inversely Associated with All-Cause and Cause-Specific Mortality in Adults. Whalen KA, Judd S, McCullough ML, Flanders WD, Hartman TJ, Bostick RM. The Journal of nutrition. 2017; 147(4):612-620. PubMed PMID: 28179490; PubMed Central PMCID: PMC5368578. Cost-Effectiveness of Immune Checkpoint Inhibition in BRAF Wild-Type Advanced Melanoma. Kohn CG, Zeichner SB, Chen Q, Montero AJ, Goldstein DA, Flowers CR. Journal of clinical oncology : official journal of the American Society of Clinical Oncology. 2017; 35(11):1194-1202. PubMed PMID: 28221865. Using Metaphors to Explain Molecular Testing to Cancer Patients. Pinheiro AP, Pocock RH, Dixon MD, Shaib WL, Ramalingam SS, Pentz RD. The oncologist. 2017; 22(4):445-449. PubMed PMID: 28220022; PubMed Central PMCID: PMC5388373. P-Selectin and ICAM-1 synergy in mediating THP-1 monocyte adhesion in hemodynamic flow is length dependent. Edwards EE, Thomas SN. Integrative biology : quantitative biosciences from nano to macro. 2017; 9(4):313-327. PubMed PMID: 28262902. The association among skeletal muscle phosphocreatine recovery, adiposity, and insulin resistance in children. Wells GD, Banks L, Caterini JE, Thompson S, Noseworthy MD, Rayner T, Syme C, McCrindle BW, Hamilton J. Pediatric obesity. 2017; 12(2):163-170. PubMed PMID: 26916682. Imaging of Prostate Cancer Using Fluciclovine. Savir-Baruch B, Zanoni L, Schuster DM. PET clinics. 2017; 12(2):145-157. PubMed PMID: 28267449. Mechanism of Acylative Oxidation-Reduction-Condensation Reactions Using Benzoisothiazolones as Oxidant and Triethylphosphite as Stoichiometric Reductant. Gangireddy P, Patro V, Lam L, Morimoto M, Liebeskind LS. The Journal of organic chemistry. 2017; 82(7):3513-3529. PubMed PMID: 28240030. Examining the structure-activity relationship of benzopyran-based inhibitors of the hypoxia inducible factor-1 pathway. Ferguson J, De Los Santos Z, Devi N, Van Meir E, Zingales S, Wang B. Bioorganic & medicinal chemistry letters. 2017; 27(8):1731-1736. PubMed PMID: 28285917; PubMed Central PMCID: PMC5398316. Cyclooxygenase-2 Induction by Amino Acid Deprivation Requires p38 Mitogen-Activated Protein Kinase in Human Glioma Cells. Li Z, Chang CM, Wang L, Zhang P, Shu HG. Cancer investigation. 2017; 35(4):237-247. PubMed PMID: 28333553.
Review of a single surgeon's stapedotomy cases performed with a nickel titanium prosthesis over a 14-year period. Justicz N, Strickland KF, Motamedi KK, Mattox DE. Acta oto-laryngologica. 2017; 137(4):442-446. PubMed PMID: 28350269. Oncoplastic Breast Reduction Technique and Outcomes: An Evolution over 20 Years. Losken A, Hart AM, Broecker JS, Styblo TM, Carlson GW. Plastic and reconstructive surgery. 2017; 139(4):824e-833e. PubMed PMID: 28350649. Recent Developments in Surgical Pathology of the Uterine Corpus. Hanley KZ, Birdsong GG, Mosunjac MB. Archives of pathology & laboratory medicine. 2017; 141(4):528-541. PubMed PMID: 28353387. Scope of the Reactions of Indolyl- and Pyrrolyl-Tethered N-Sulfonyl-1,2,3-triazoles: Rhodium(II)-Catalyzed Synthesis of Indole- and Pyrrole-Fused Polycyclic Compounds. Fu L, Davies HM. Organic letters. 2017; 19(7):1504-1507. PubMed PMID: 28358204. Co-amplification of phosphoinositide 3-kinase enhancer A and cyclin-dependent kinase 4 triggers glioblastoma progression. Qi Q, Kang SS, Zhang S, Pham C, Fu H, Brat DJ, Ye K. Oncogene. 2017; PubMed PMID: 28368413. Molecular impact of selective NFKB1 and NFKB2 signaling on DLBCL phenotype. Guo X, Koff JL, Moffitt AB, Cinar M, Ramachandiran S, Chen Z, Switchenko JM, Mosunjac M, Neill SG, Mann KP, Bagirov M, Du Y, Natkunam Y, Khoury HJ, Rossi MR, Harris W, Flowers CR, Lossos IS, Boise LH, Dave SS, Kowalski J, Bernal-Mizrachi L. Oncogene. 2017; PubMed PMID: 28368397. Caution in interpretation of disease causality for heterozygous loss-of-function variants in the MYH8 gene associated with autosomal dominant disorder. Dai Z, Whitt Z, Mighion LC, Pontoglio A, Bean LJ, Colombo R, Hegde M. European journal of medical genetics. 2017; PubMed PMID: 28377322. Comparative Phytochemical Analysis of Chinese and Bay Starvine (Schisandra spp. ): Potential for Development as a New Dietary Supplement Ingredient. Lyles JT, Tyler P, Bradbury EJ, Nelson K, Brown CF, Pierce ST, Quave CL. Journal of dietary supplements. 2017; :1-13. PubMed PMID: 28384001. Modulation of Bax and mTOR for cancer therapeutics. Li R, Ding C, Zhang J, Xie M, Park D, Ding Y, Chen G, Zhang G, Gilbert-Ross M, Zhou W, Marcus A, Sun SY, Chen ZG, Sica GL, Ramalingam SS, Magis A, Fu H, Khuri F, Curran WJ, Owonikoko TK, Shin DM, Zhou J, Deng X. Cancer research. 2017; PubMed PMID: 28381544. The role of postmastectomy radiotherapy in women with pathologic T3N0M0 breast cancer. Cassidy RJ, Liu Y, Kahn ST, Jegadeesh NK, Liu X, Subhedar PD, Arciero CA, Gillespie TW, Torres MA. Cancer. 2017; PubMed PMID: 28387923. Non-linear patterns in age-related DNA methylation may reflect CD4(+) T cell differentiation. Johnson ND, Wiener HW, Smith AK, Nishitani S, Absher DM, Arnett DK, Aslibekyan S, Conneely KN. Epigenetics. 2017; :0. PubMed PMID: 28387568. Stereochemical Complexity in Oxocarbenium-Ion-Initiated Cascade Annulations for the Synthesis of the ABCD Core of Mattogrossine. Kong A, Andreansky ES, Blakey SB. The Journal of organic chemistry. 2017; 82(8):4477-4483. PubMed PMID: 28393520. Use of CRISPR/Cas9 to model brain diseases. Yan S, Tu Z, Li S, Li XJ. Progress in neuro-psychopharmacology & biological psychiatry. 2017; PubMed PMID: 28392484. Contrast-enhanced ultrasound imaging in vivo with laser-activated nanodroplets. Yoon H, Yarmoska SK, Hannah AS, Yoon C, Hallam KA, Emelianov SY. Medical physics. 2017; PubMed PMID: 28391597. Simply put: Vaccination saves lives. Orenstein WA, Ahmed R. Proceedings of the National Academy of Sciences of the United States of America. 2017; 114(16):4031-4033. PubMed PMID: 28396427; PubMed Central PMCID: PMC5402432. Structural analysis of the glucocorticoid receptor ligand-binding domain in complex with triamcinolone acetonide and a fragment of the atypical coregulator, SHP. Weikum ER, Okafor DC, D'Agostino EH, Colucci JK, Ortlund EA. Molecular pharmacology. 2017; PubMed PMID: 28396564. Omicseq: a web-based search engine for exploring omics datasets. Sun X, Pittard WS, Xu T, Chen L, Zwick ME, Jiang X, Wang F, Qin ZS. Nucleic acids research. 2017; PubMed PMID: 28402462. Calcium and bone turnover markers in acromegaly: a prospective controlled study. Constantin T, Tangpricha V, Shah R, Oyesiku NM, Ioachimescu OC, Ritchie J, Ioachimescu AG. The Journal of clinical endocrinology and metabolism. 2017; PubMed PMID: 28407138. Simple biochemical networks allow accurate sensing of multiple ligands with a single receptor. Singh V, Nemenman I. PLoS computational biology. 2017; 13(4):e1005490. PubMed PMID: 28410433. Gene and Variant Annotation for Mendelian Disorders in the Era of Advanced Sequencing Technologies. Chakravorty S, Hegde M. Annual review of genomics and human genetics. 2017; PubMed PMID: 28415856. Detection of prostate cancer-specific transcripts in extracellular vesicles isolated from post-DRE urine. Pellegrini KL, Patil D, Douglas KJS, Lee G, Wehrmeyer K, Torlak M, Clark J, Cooper CS, Moreno CS, Sanda MG. The Prostate. 2017; PubMed PMID: 28419548. Corrigendum: The OncoPPi network of cancer-focused protein-protein interactions to inform biological insights and therapeutic strategies. Li Z, Ivanov AA, Su R, Gonzalez-Pecchi V, Qi Q, Liu S, Webber P, McMillan E, Rusnak L, Pham C, Chen X, Mo X, Revennaugh B, Zhou W, Marcus A, Harati S, Chen X, Johns MA, White MA, Moreno CS, Cooper LAD, Du Y, Khuri FR, Fu H. Nature communications. 2017; 8:15350. PubMed PMID: 28416792. Primary Pediatric Breast Lesions: Comparing the Prevalence of Malignancies in the Middle East with North America; Review of 1031 Cases. Broecker JS, Khoshnam N, Thompson L, Anis S, Kamal N, Gillespie S, Kantarovich D, Metry D, Mills MP, Drummey R, Williams B, Shehata BM. Fetal and pediatric pathology. 2017; 36(2):139-148. PubMed PMID: 28426344. Nitric oxide-regulated proteolysis of human CYP2B6 via the ubiquitin-proteasome system. Lee CM, Tripathi S, Morgan ET. Free radical biology & medicine. 2017; PubMed PMID: 28427998. Unmet needs in the first-line treatment of follicular lymphoma. Casulo C, Nastoupil L, Fowler NH, Friedberg JW, Flowers CR. Annals of oncology : official journal of the European Society for Medical Oncology. 2017; PubMed PMID: 28430865. Identifying tagging SNPs for African specific genetic variation from the African Diaspora Genome. Johnston HR, Preethi Boorgula M, Hu YJ, Campbell M, Gao J, Chavan S, O'Connor TD, Ford JG, Abecasis GR, Foster C, Wojcik GL, Gao L, Gignoux CR, Hansel NN, Gourraud PA, Horowitz E, Lizee A, Huang L, Hansen M, Ortiz R, Genuario R, Potee J, Bullis D, Rafaels N, Lawley C, Ruczinski I, Kenny EE, Scott AF, Bustamante C, Taub MA, Beaty TH, Vergara C, Mathias RA, Levin AM, Barnes KC, Padhukasahasram B, Qin ZS, Williams LK, , Dunston GM, Faruque MU, Gietzen K, Deshpande A, Grus WE, Locke DP, Foreman MG, Avila PC, Grammer L, Kim KA, Kumar R, Schleimer R, De La Vega FM, Shringarpure SS, Musharoff S, Burchard EG, Eng C, Hernandez RD, Pino-Yanes M, Torgerson DG, Szpiech ZA, Torres R, Nicolae DL, Ober C, Olopade CO, Olopade O, Oluwole O, Arinola G, Song W, Correa A, Musani S, Wilson JG, Lange LA, Akey J, Bamshad M, Chong J, Fu W, Nickerson D, Reiner A, Hartert T, Ware LB, Bleecker E, Meyers D, Ortega VE, Maul P, Maul T, Watson H, Ilma Araujo M, Riccio Oliveira R, Caraballo L, Marrugo J, Martinez B, Meza C, Ayestas G, Francisco Herrera-Paz E, Landaverde-Torres P, Erazo SOL, Martinez R, Mayorga A, Mayorga LF, Mejia-Mejia DA, Ramos H, Saenz A, Varela G, Marina Vasquez O, Ferguson T, Knight-Madden J, Samms-Vaughan M, Wilks RJ, Adegnika A, Ateba-Ngoa U, Yazdanbakhsh M. Scientific reports. 2017; 7:46398. PubMed PMID: 28429804; PubMed Central PMCID: PMC5399604. Electromechanical Coupling Factor of Breast Tissue as a Biomarker for Breast Cancer. Park K, Chen W, Chekmareva M, Foran D, Desai J. IEEE transactions on bio-medical engineering. 2017; PubMed PMID: 28436838. Long -Term Survival in Stage IV Esophageal Adenocarcinoma with Chemoradiation and Serial Endoscopic Cryoablation. Spiritos Z, Mekaroonkamol P, Rayes BFE, Force SD, Keilin SA, Cai Q, Willingham FF. Clinical endoscopy. 2017; PubMed PMID: 28434215. Proliferative Vitreoretinopathy in Treated Retinoblastoma. Hwang CS, Mendoza PR, Wells JR, Grossniklaus HE, Hubbard 3rd GB. Ophthalmology retina. 2017; 1(2):165-172. PubMed PMID: 28435935; PubMed Central PMCID: PMC5396968. Upper pole urologist-obtained percutaneous renal access for PCNL is safe and efficacious. Patel AP, Bui D, Pattaras J, Ogan K. The Canadian journal of urology. 2017; 24(2):8754-8758. PubMed PMID: 28436364. Dilator Use After Vaginal Brachytherapy for Endometrial Cancer: A Randomized Feasibility and Adherence Study. Hanlon A, Small Jr W, Strauss J, Lin LL, Hanisch L, Huang L, Bai J, Wells J, Bruner DW. Cancer nursing. 2017; PubMed PMID: 28437283. Oxidative Stress. Sies H, Berndt C, Jones DP. Annual review of biochemistry. 2017; PubMed PMID: 28441057. A three-dimensional collagen-fiber network model of the extracellular matrix for the simulation of the mechanical behaviors and micro structures. Dong S, Huang Z, Tang L, Zhang X, Zhang Y, Jiang Y. Computer methods in biomechanics and biomedical engineering. 2017; :1-13. PubMed PMID: 28441880. Orphan CpG islands define a novel class of highly active enhancers. Bell JSK, Vertino PM. Epigenetics. 2017; :1-16. PubMed PMID: 28448736. Dense array of spikes on HIV-1 virion particles. Stano A, Leaman DP, Kim AS, Zhang L, Autin L, Ingale J, Gift SK, Truong J, Wyatt RT, Olson AJ, Zwick MB. Journal of virology. 2017; PubMed PMID: 28446665. Proliferation of PD-1+ CD8 T cells in peripheral blood after PD-1-targeted therapy in lung cancer patients. Kamphorst AO, Pillai RN, Yang S, Nasti TH, Akondy RS, Wieland A, Sica GL, Yu K, Koenig L, Patel NT, Behera M, Wu H, McCausland M, Chen Z, Zhang C, Khuri FR, Owonikoko TK, Ahmed R, Ramalingam SS. Proceedings of the National Academy of Sciences of the United States of America. 2017; PubMed PMID: 28446615. Progress and opportunities for enhancing the delivery and efficacy of checkpoint inhibitors for cancer immunotherapy. Francis DM, Thomas SN. Advanced drug delivery reviews. 2017; PubMed PMID: 28455187. Urothelial carcinoma involving the ureteral orifice: A clinicopathologic analysis of 93 cases. Annan AC, Stevens KA, Osunkoya AO. Human pathology. 2017; PubMed PMID: 28465130. Smoking History Predicts Sensitivity to PARP Inhibitor Veliparib in Patients with Advanced Non-small Cell Lung Cancer. Reck M, Blais N, Juhasz E, Gorbunova V, Jones CM, Urban L, Orlov S, Barlesi F, Kio E, Keilholz U, Qin Q, Qian J, Nickner C, Dziubinski J, Xiong H, Mittapalli RK, Dunbar M, Ansell P, He L, McKee M, Giranda V, Ramalingam SS. Journal of thoracic oncology : official publication of the International Association for the Study of Lung Cancer. 2017; PubMed PMID: 28461256.